Association Robert Schuman – a.s.b.l. The Interreg North West Europe Monitoring Committee invited by Ministère de l’Aménagment du territoire et de l’Energie met on 6-7 February 2019 in Luxembourg. The delegates from Belgium, Danmark, Germany, Ireland, Luxembourg, the Netherlands the United Kingdom visited the Schuman birth house . They were briefed on the Father of Europe’s multinational origines, the circumstances of the foundation of the European Coal and Steel Comunity and the choice of Luxembourg city as the European Community’s first capital. 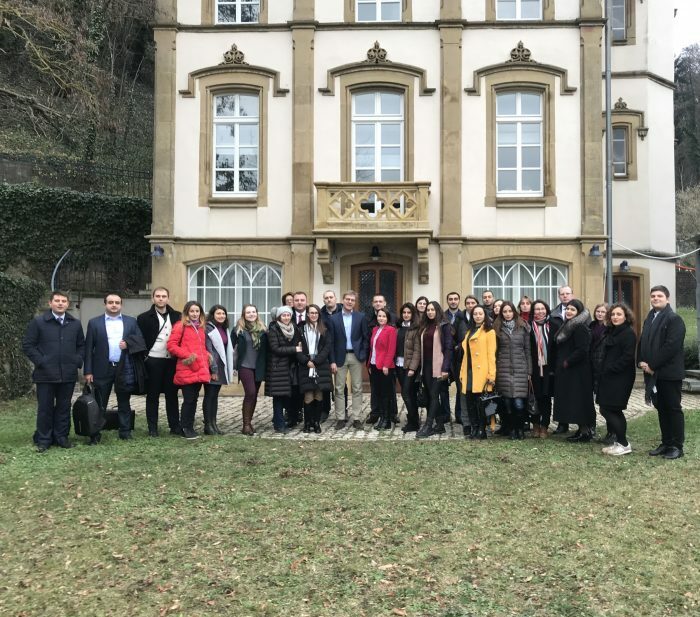 On 24-25 January 2019, the Gilbert Trausch Room hosted the 8th PhD Seminar organised by the Faculty of Law, Economics and Finance of the University of Luxembourg in collaboration with ECLAN (European Criminal Law Academic Network). The ECLAN PhD seminar aims to gather together PhD candidates working in the field of EU criminal law and holding a degree in law, political science or international studies. It provides a friendly environment in which PhD students can gain experience in presenting their research, learn from each other’s research and develop contacts with other researchers in their field. In the aftermath of the 25th anniversary of the entry into force of the Treaty of Maastricht, the 2019 edition of the Seminar represented an opportunity to reflect on the development of EU criminal law over the last quarter-century and to discuss the challenges ahead. 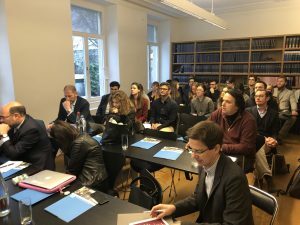 20 PhD candidates studying at 14 European universities gave a presentation at the Seminar, which also hosted a guest lecture by François Biltgen, Judge at the Court of Justice of the European Union. After an engaged and fruitful discussion the students from the Riga Graduate School of Law (Latvia) on the role of Luxembourg as a small member state in the EU, the issue of supranationality, the importance of common rules, the functioning of the EU, economic coherence across borders, mobility and s.o. visited the birth house of Robert Schuman. Interview mit dem Brüssel-Korrespodenten der ARD, Malte Pieper über die Rolle Luxemburgs als Europahauptstadt. RTL Radio und Fernsehen haben über die Staatskrise von 1918-1919 in Luxemburg berichtet. Vor genau hundert Jahren, am 15.Januar 1919, leistete Großherzogin Charlotte den Eid auf die Verfassung. Historiker Jean-Marie Majerus erläuterte die widrigen Umstände die zur Abdankung der Großherzogin Marie Adelheid führten einem interessierten Publikum und erklärte inwiefern die neue Großherzogin Charlotte zur einer Bestandsgarantie für die luxemburger Monarchie wurde in einem schwierigen Umfeld in dem sowohl die Unabhängigkeit Luxemburgs als auch seine Staatsform in Frage gestellt wurden. The Professional Training Service European Court of Auditors has organized a special training for a group of newly arrived staff members at the Court on 16th October 2018. As it is necessary for the younger staff members to know how the European Communities were founded, Mr. Dimitrios Vavatsis, course developer – Professional Training, proposed a visit to the Robert Schuman’s birth House. The historical introduction was delivered by the head of the Robert-Schuman-Center Jean-Marie Majerus. Dans le cadre d’un séminaire (2-7 octobre 2018) organisé par le Luxembourg Centre for Contemporary and Digital History (C²DH) and Tambov State University (Russie) des étudiants russes et luxembourgeois se sont penchés sur de multiples carrefours de l’histoire du Luxembourg et de la Russie. La journée passée à la Maison Schuman était dédiée aux perceptions réciproques de l’un et l’autre du temps de la guerre froide jusqu’à aujourd’hui. Le 14 septembre 2018, Françoise Hermann, présidente de l’Association des Amis d’Edmond Dune, en collaboration avec le Centre national de littérature et l’Université de Luxembourg a présenté une nouvelle conférence dans le cycle « Sur les traces d’Edmond Dune » en la Maison natale de Robert Schuman. Cette troisième conférence était consacrée à « Edmond Dune et ses guerres : les pièces de théâtre». Le professeur Frank Wilhelm de l’Université du Luxembourg, éditeur et fin connaisseur des pièces de théâtre de Dune a illustré au cours d’une présentation très didactique les nombreuses facettes des pièces d’Edmond Dune devant un public très intéressé.